I’ve been subconsciously putting off writing a blog for Alberta, partly cos we zig zagged our way through and spent quite a long time there, partly cos we haven’t really stopped and the crossing from Alberta to BC was so blurred, and partly cos I’m loosing motivation as we get close to the finish line. I could probably sum up the following blog in a couple of sentences; the Icefields Parkway, Rocky Mountains and Lake Abraham were a dream come true…And now I’m ready to go home. The first few days in Alberta were really just a continuation of Saskatchewan, with a few more towns dotting the way. The road did get hillier pretty much as we passed through the border town of Lloyminster and the farmland got greener with more lakes and more trees. We pulled a couple of big days to get to Edmonton, and even saw the world’s biggest Pysanka (Ukranian Easter Egg) in Vegreville. After two 100km+ days, we reached Edmonton and it was more than a little terrifying cycling in to the city! Even though we took a quieter route in, there were still sections of 4 lane highway where the shoulder would just disappear. We made it safe enough though and were hosted for 4 nights by Kirsty’s friend Cat and her boyfriend Stu. Kirsty and Cat went to primary school together, and Cat left just before I arrived…And that was the last time they saw each other! It was awesome to reconnect and share lots of laughs in Edmonton with them. We even were able to enjoy Guns and Roses playing at a nearby stadium from there balcony, and indulged in plenty of red wine and good food. Cat and Stu decided they also fancied a trip to the mountains, and offered to take us the 400km along the highway to Jasper. As a 4 hour drive for them meant 4 days of cycling for us, and we would get an extra night of camping with them, we eagerly accepted. It was a shame not to get the full effect of cycling in to the foothills, but we were grateful to miss 4 days of busy, divided highway and get to the country we’d been anticipating for so long. It was a misty and foggy morning as we awoke in Hinton at the base of the Rockies, but we enjoyed a dip in the Miette Hot Springs on the way to Jasper, surrounded by the atmospheric fog hiding the mountain peaks from view. It was less than an hour from there to Jasper, and although the mountains were still hidden in cloud, we gradually became more and more surrounded and it was just beautiful. We arrived to a drizzly Jasper town, but as it cleared up I just fell in love. The town is obviously touristy, but not tacky or overwhelming, and the mountains on every horizon just make it an awesome place to be. We stayed with friends of friends of Cat’s, and Sharon and her daughters India and Anika were such a pleasure (/honour) to meet and we set off the next day with warm hearts and a great excitement for what was to come. I had a massive smile on my face as we cycled off on to the Icefields Parkway, and it didn’t leave for the next 5 days. We decided to take it really slow, stopped whenever we wanted and surrounding ourselves with the stillness and silence of the mountains. Bike travel really came in to it’s own, as we were able to stop at places that cars and other tourists couldn’t and really soak up the surroundings. I was quite nervous about seeing bears but we didn’t spot any, and I felt perfectly safe staying in the HI Wilderness Hostels and at the campgrounds. Each were very good about food storage and waste management, avoiding the areas becoming a bear attractant. We stopped at Athabasca Falls and Beauty Creek for the first two nights, and although our bikes were heavy with five days worth of supplies and the road was hilly, the scenery kept us going. The Goat and Glacier lookout spot was one of the most beautiful sights I’ve ever seen – blue, grey and red mountains towering over forest and a river valley where we could just imagine bears living and playing. Beauty Creek really lived up to its name, and we made the most of the hammocks by the river (of course surrounded by mountains) and felt very grateful for the last three months that got us here. Basically every corner we turned was just beautiful. The road is lined with pine trees but the mountains tower above in every direction. From Beauty Creek we had a big climb up to the Columbia Icefield, so we’d planned a particularly short day to do it. The hill turned out to be nowhere as bad as we had heard or expected, and I even managed to cycle the whole thing. There were lots of places to stop to catch our breaths and take in the scenery, which certainly helped. As we approached the glacier, one of Kirsty’s spokes decided to give up. An attempt at cable tying it to the adjacent one didn’t work and her wheel instantly went out of alignment. Long story short she managed to get a ride all the way back to Jasper, get her wheel fixed, and then hitched back to the Icefields where I waited overnight, making the most of the Wilcox Pass Hike and chatting to other travellers. Our next stop was Rampart Creek hostel which again was such a treat. They were equipped with their own wood burning sauna and as a thunderstorm rolled through during the night, we were very grateful not to be in our tents. The drizzle was still there the following morning, but after 5 days of bluebird skies we couldn’t complain. My dad and granny were flying out to meet us in a few days time, and if we continued to head straight south we’d arrive too early, so we decided to turn off the Icefields Parkway and head East instead. We headed down Highway 11 and it was such a treat. The level of traffic dropped to about 10% of what it had been, and Lake Abraham was so beautiful. The blue colour of the water stood out even with an overcast sky, and then when the clouds cleared it was just amazing. We felt very lucky to have found a somewhat secret spot that was really just as beautiful as the Icefields Parkway. We cycled through Nordegg and on to Rocky Mountain House. We were both feeling pretty good and the weather was nice again…Until we left Rocky Mountain House. As we packed up our tents it began to get drizzly, then just got worse and worse. We were heading South for Calgary where we’d meet Dad and Granny and the rain just didn’t stop. Amazingly on our first day in the rain we were picked up by a truck who was actually travelling in the other direction, but when he saw us powering on with our heads down through the rain he turned around and offered us a lift to our destination. And on our second day, our warmshowers host Sheila met us 10km from her home and took our bags, making the last cold section so much more enjoyable. Our evening with Sheila was also just a dream, we had hot showers, enjoyed a delicious meal with red wine and slept soundly in comfortable beds. We got to Calgary the next day with no trouble, met Dad and Granny and enjoyed 4 days of no cycling with them in Canmore, Banff and Lake Louise. Then since leaving Lake Louise (and so Alberta), we’ve travelled through Golden, Revelstoke, Chase and Kamloops. It’s been a little bit chilly and we’re both a little bit tired. We’ve mostly been on Highway 1, the trans Canada route, and it is so busy with cars that sometimes it’s hard to appreciate the beautiful scenery. Our first two days were relatively big and BC is hilly (!) and truth be told Kirsty was not enjoying herself one bit. So we slowed it down and are now doing 50/60/70km days until we reach the coast. British Columbia really is beautiful, but it’s hard not to think about the finish line and everything and everyone that’s waiting for us at home. As I said on Facebook recently, lots of people we meet and people at home say we must be brave, but I still worry and at times am afraid. Even though we only have 7 days to go we are heading in to mountainous bear country and I’m nervous about what’s to come. However, this makes each little achievement even more special and I feel so proud when I reflect on what we’ve seen and done already. The land of golden fields and blue skies… and headwind. Lots and lots of headwind. 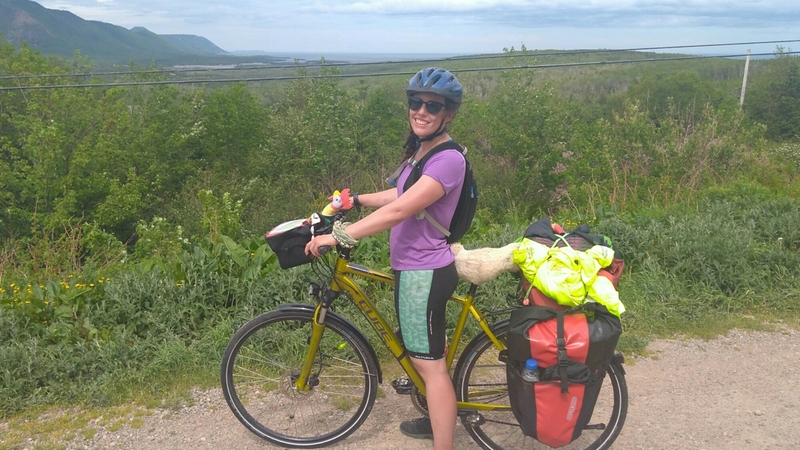 Saskatchewan was the first of our last three provinces, and I felt motivated to cycle strongly to make the most of the relatively short time we had left on our bikes. We’d had a fantastic rest in Manitoba and after seeing Paul and having a little taste of home, I was beginning to get excited about finishing and getting back to family and friends in Scotland. People say that in Saskatchewan you can see your dog (or wife) run away for three days, and after hearing this joke only a few hundred times, we were expecting Saskatchewan to be pretty flat. Imagine then our surprise when in our first 5km of the province we found a massive valley. We enjoyed the downhill rush, but the uphill slog was a bit of a rude awakening. Especially when we reached the top and Kirsty spotted my back tyre was a bit low. On further inspection the tyre had been pierced with a piece of glass, so 12km in to our first day back on the bikes I was at the side of the road trying to patch up the rear tyre and tube. Super fun. The next day was when the headwind started. It’s said that no matter what direction you are cycling in the prairies, the wind is always against you. It didn’t start out too badly but gradually got worse and worse and was exhausting. We had been aiming to do about 80km and reach Foam Lake but by 4pm we literally had no energy left. 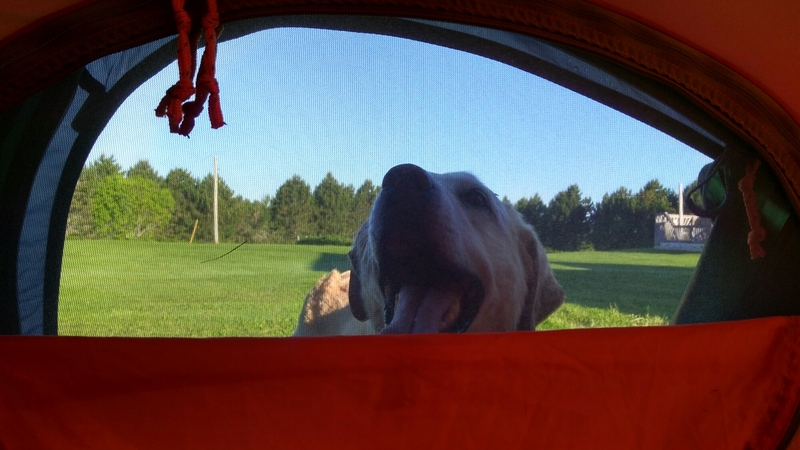 We decided to call it a day and ended up camping happily on another farmer’s field, both asleep before 8pm. We vowed to set off earlier the next day, hoping to “beat” the wind and make more progress towards Saskatoon – our half way point through Saskatchewan. Unfortunately, the wind also decided to get up early and by the time we’d cycled the 20km to Foam Lake we were already feeling disheartened. We met a french couple, Oceana and David who were cycling in the same direction as part of their 2 year cycle around the world. They too were struggling and was nice to get reassurance that we weren’t just soft! We powered on over the next couple of days, stopping every 15-20km at the communities along the way to break up the journey in to bitesize chunks. More than in any other province, we got so many toots and waves from passing cars, and this definitely lifted our spirits as we peddled on. We surprised ourselves a couple of times by getting further than expected and we couldn’t really tell if the wind was getting lighter or we were just getting more determined. After two 95km ish days we made it to our warmshowers host, Hamilton, in Saskatoon. We were both exhausted, but it was so nice to arrive a day earlier than we expected and enjoy eating and sharing stories of adventure. Hamilton cooked us a delicious Israeli meal that he’d picked up on his travels, and we slept well indoors after a few nights in the tents. Saskatoon itself is a nice city, I bought a foldaway tyre to keep as a spare and we enjoyed a long lunch. We both gave the bikes a well needed clean before sharing another meal with Hamilton. Saskatoon has a strong Ukrainian heritage so Hamilton made us perogies, a boiled bread dough filled with Saskatoon berries… delicious! We set off again feeling refreshed and motivated, this time with Edmonton in our sights…just a small 530km away. Leaving the city was pretty terrifying as there was no way to avoid really big, busy roads…but we made it and arriving on the long, open highway felt amazing. We even had a tailwind!! We just flew along and the cycle felt like no effort at all compared to the road leading towards Saskatoon. We were able to have conversation, and suprised ourselves again by doing 110km in 5 hours of cycling. Sadly the headwind was back the following day and we had 35km to cycle from our camping spot before we get water and coffee. It was the first time we’d had to cycle so far and reminded us on the importance to carry extra water through slightly less populated areas. Coffee tasted amazing and we ended up hiding in Tim Horton’s for almost two hours before building up the motivation to cycle on. As the wind was strong, we decided to allow ourselves to have a short day and headed for a village another 35km away which google told us had a church. We’d met some cyclists along the way who told us they often camped in church gardens, and although we hadn’t done it so far, we decided it would be a good option for the night. We arrived at the said church in the quiet village, and it had lots of grass perfect for pitching our tents. We knocked on the door and found it locked, when a voice across the road asked if we needed any help. When we explained to Marilyn that we were looking for somewhere to pitch our tents for the night, she first invited us to pitch them in her garden, then invited us to join her for dinner, and finally invited us to actually sleep inside. It was amazing how quickly she invited us in to her home, acting purely on kindness and we were blown away. We had a lovely evening with her, her husband and their friends, and slept soundly in a soft, comfy bed. We even had a shower! We left the following day with warm hearts and even the wind wasn’t too bad to begin with. It soon picked up though and was blowing in our faces once again. We were aiming for Lloyminster, the border town between Saskatchewan and Alberta. At 100km away, Maidstone at 50km seemed like a good place to stop for lunch. Marilyn had sent us away with some fresh veges so I planned to eat that for lunch and Kirsty headed to the gas station to pick something up…but the universe at other ideas again. A motorcyclist called us over asking where we were from, where we were going… the usual questions. He said he and his friend were biking to Alaska and had passed us on the highway. Impressed with what we were doing, he invited us to join them for lunch…his treat. As we sat down, Quan’s friend Greig was talking to a man at the next table who mentioned he’d seen us on the road the day before as well. He soon left for the road and we enjoyed a hilarious lunch with Quan and Greig hearing stories of their 30 year long friendship. After we’d eaten, the waitress came over to tell us that the man we’d spoken to as we sat down had paid for all our lunches before he left, simply with the message “pay it forward”. We were all blown away, and Kirsty and I cycled away slightly in disbelief at the last hour. Selfless random acts of kindness rarely happen, and I vowed (not for the first time) to pay back all this kindness and more as we travel on and after I get home. We didn’t quite make it to Lloydminster, but camped 15km short…staying in Saskatchewan for our last night. Although the province for us had been mostly spend on the highway and we hadn’t got to really explore and experience it like we had done other provinces. It was still enjoyable and I’d found the endless fields, farmland and sunny skies really beautiful. 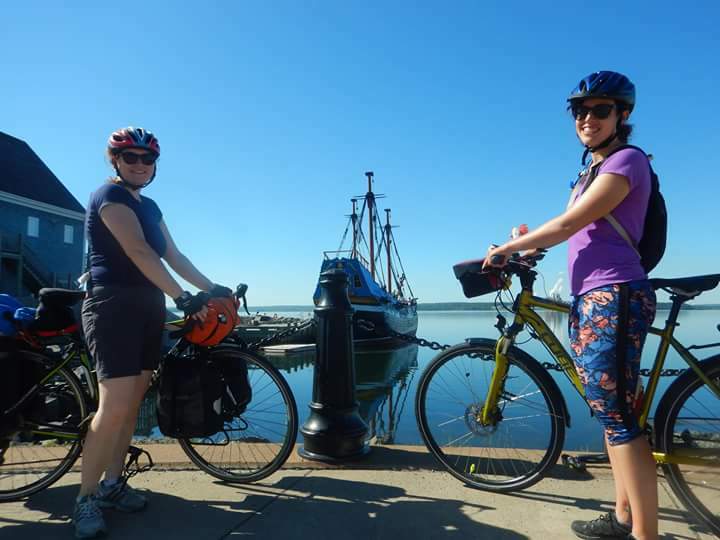 We’d had a taste of what it would be like to stick to the trans-Canada highway for the whole journey, and although it’s not the type of cycling I would want to do for 4 months, it wasn’t totally awful and did allow us to average 90-100km a day and get ever closer to the Rocky Mountains. The prairies certainly weren’t as awful as so many people had warned. Now, Alberta, let’s see what you have to say. 1. Don’t aim to do what everyone else is doing. 2. Don’t be ashamed of public transport, if you aren’t enjoying a section then skip it! 3. Get used to the constant smell of roadkill. 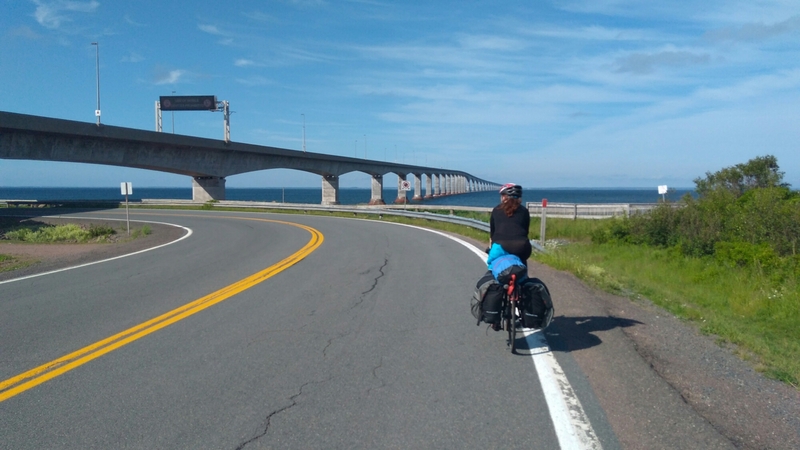 We were feeling quite tired after New Brunswick and decided to take a bus to Quebec City, skipping about 600km and overtaking a couple of trans-Canada cyclists we knew were just a couple of days ahead of us. 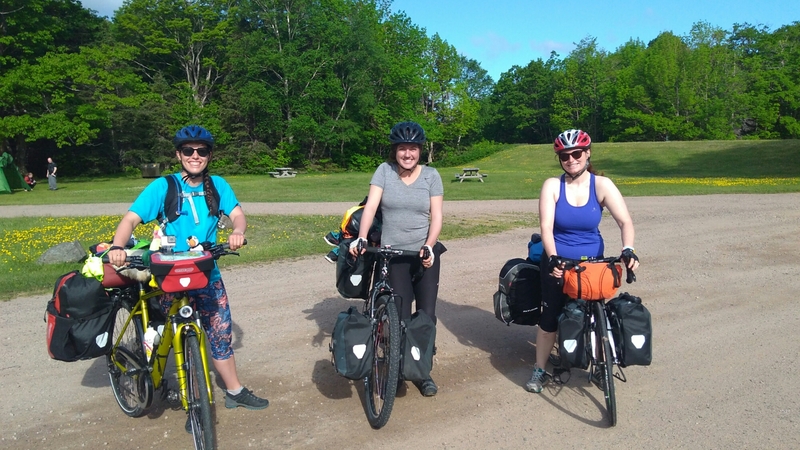 I was disappointed not to catch them by pedal power, but the decision to take the bus dominoed in to us having more mental and physical energy to really enjoy Quebec. Our lasting impressions of each province has mostly been influenced by the people we have met, and this was especially true for Quebec. Rather than describe our journey through this wonderful French-Canadian province by the places we went to, I’ll do so by the wonderful French-Canadians we met along the way. 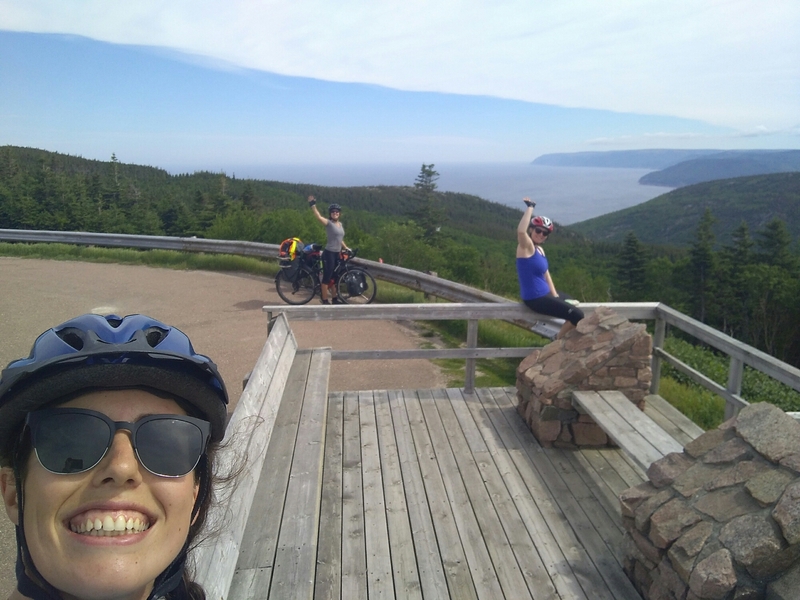 We met Jonathan and Vanessa on the Cabot Trail and they’d told us to get in touch when we knew we’d be in Quebec City as they could give us a place to stay. Due to the decision to take the bus, we gave Jonathan 24 hours notice and he was still awesome enough to meet us off the bus and direct us to his apartment. We arrived deflated but relieved, and we were able to stay in Jonathan’s downtown Quebec City apartment for two nights, relaxing and doing laundry, and sharing dinner and rooftop beers with the two of them. Quebec is a French speaking province so we tried to mine our memories and practice our rusty high school French. The city itself is beautiful, clean and welcoming and expands from a fortified old town with wonderful architecture and delicious cafes. We wondered around for two days, taking in the Notre Dame, Chateau Frontenac, Plains d’Abraham and the farmers market where I’d have what at the time was the most delicious cake I’d ever had. More on that later. In our efforts to relax but explore, we decided to head to Ile d’Orleans in Quebec City harbour. The bridge over is just north east of the old town, so we arranged a warmshowers for near there. As they are not on a main cycle touring route, Francine and Jean only get one or two guests a year through warmshowers so our stay with them felt really special. They are a pair of geologists, and among other trips have spent 3 months cycling in Japan. They also have an amazing doglike cat called Hanzo who loved to sniff everything including my face in the middle of the night. We had a great evening with them and were spoilt with baguette, cheese, wine and BBQ’d chicken. They lived near the Montmorency waterfalls so we set off for there in the morning before heading to the island. Quebec City has great cycle paths and we were able to follow them all the way to the falls. We had originally planned for a little swim, but as we began to hear the falls from afar we realised this probably wasn’t a good idea. The bridge to Ile d’Orleans is impressive but quite terrifying to cross by bike even with no wind. There was construction going on which meant we had to walk over, and seeing the workmen hanging over the side really gave me the willies. We were hit by the smell of strawberries as soon as we crested the steep hill after the bridge, and knew we’d enjoy our two days here. 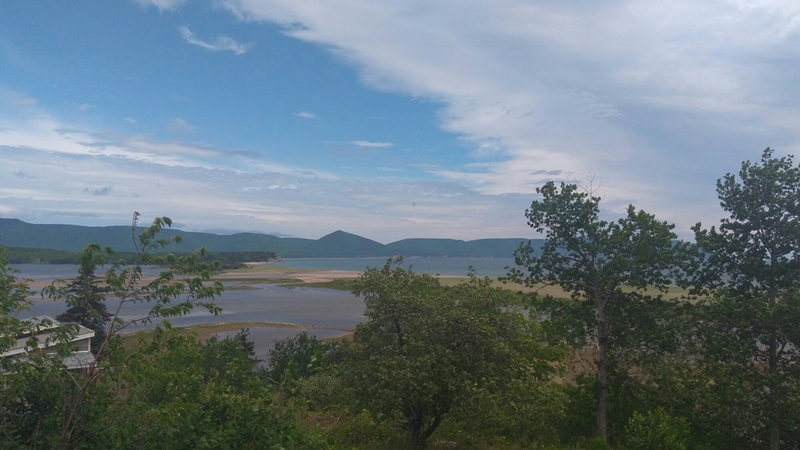 We’d planned an overnight about halfway around the 66km island so took our time stopping at view points, chocolate shops and roadside strawberry stands. Ile d’Orleans is famous for it’s strawberries and once you taste them it’s easy to know why. I felt very fortunate to be there in the height of the season and relished in the cheap bulk buy. We headed for St Jean and arrived with Marc and Madeleine in the late afternoon sun. We were gifted with a private corner of their garden and my favourite camp spot of the trip so far. We set up with a view over the St Lawrence river, dipped our legs in the water and spent the evening (and next morning) eating strawberries, reading and relaxing. It felt like a little slice of heaven. We set off feeling refreshed and cycled around the northeast of the island, which I thought was even more beautiful. We were surrounded by rolling farmland and had the Quebec hills in the background, just beautiful! We took our time, stopping at the cheese shop and enjoying the sunshine. Unfortunately the heat got to my head a bit and although we were supposed to meet Pete from the Newfoundland ferry in the city, I called Francine and Jean to see if they minded hosting us again as I wasn’t feeling great. They kindly said they would so we headed back there and I had a nap with Hanzo while Kirsty went to meet Pete. Again we were spoilt with a delicious dinner and laughter, and we left the next day feeling like old friends. We had a few options of where to go from Quebec and I was really keen to explore more than just the direct, obvious route to Montreal… especially as we’d taken the bus. 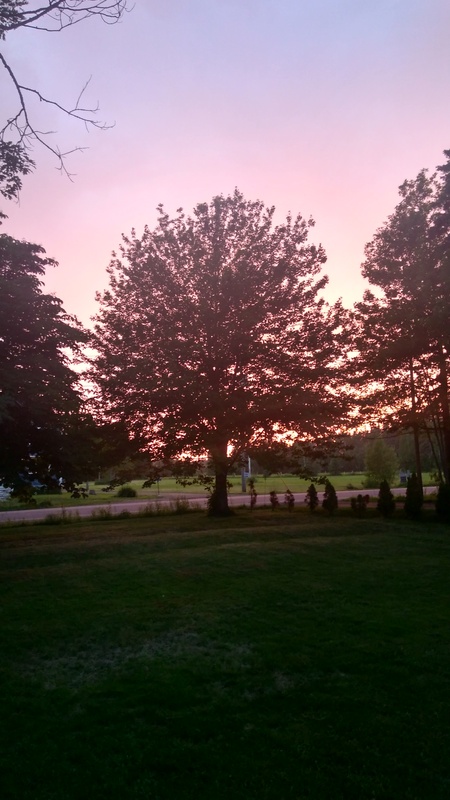 Kirsty wasn’t keen on heading north as we’d have to double back on ourselves, so we decided to organise a workaway on a farm in southern Quebec and take 4 days to get there, taking in the Eastern townships on the way. We planned to set off early, but the rain had other ideas. This was a blessing in disguise as Francine was able to take us to the supermarket to stock up on things and we had time to meet my uni friend Jillian for coffee who just so happened to be in Quebec City. The rain cleared around lunch time, so we took the short ferry over the St Lawrence and followed the cycle path towards Sainte Marie where we had (another) warmshowers organised. 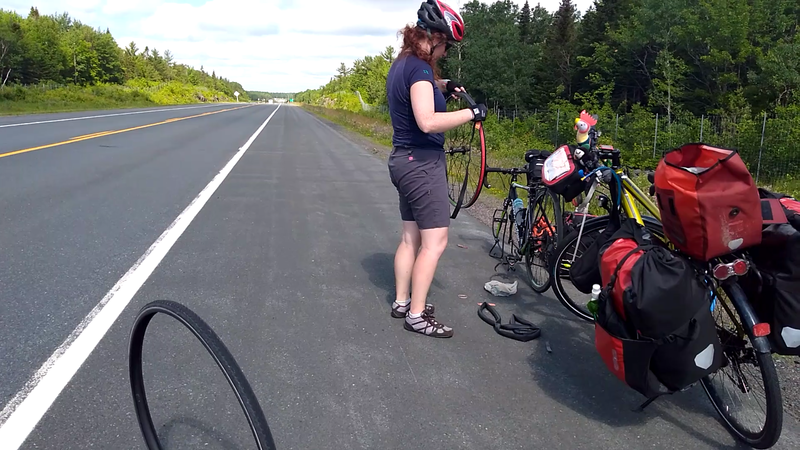 We met another cyclist on the way and as we got chatting realised that, as he was heading to New Brunswick, we were going the wrong way. So we turned back around, got a bit more lost, but eventually found ourselves out of suburbia and in quiet farmland heading in the right direction. The cycle path took us alongside a weaving river and the landscape was really pretty. After almost 80km we arrived in Sainte Marie in the early evening and again were warmly welcomed by Mario. 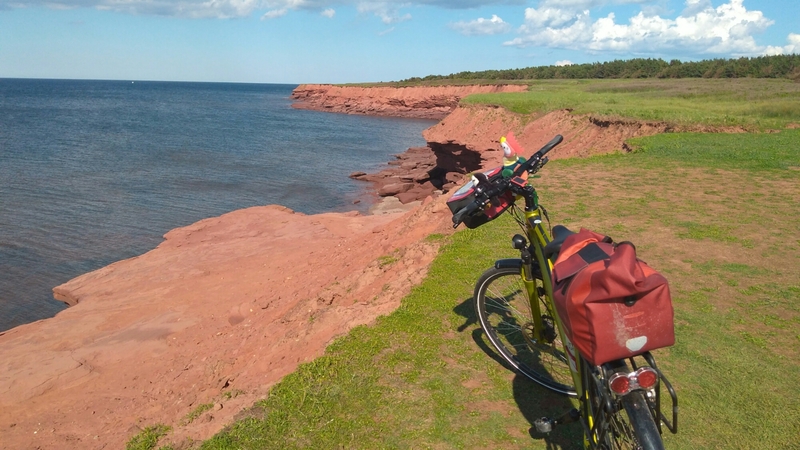 He and his wife had cycled trans-Canada in 2013, and had since cycled both USA coasts as well as some Europe trips. He was so passionate about bike travel and it was so special to hear about his experiences and favourite places. As would be the theme with the rest of our hosts in Quebec, we were his second warmshowers guest and it made the stay feel like a real event. Mario cooked us a delicious BBQ and in the morning made fresh croissants. We loved hearing more stories of cycling mishaps, and were in tears of laughter as he told of the time he got caught in a cycle path barrier after arriving at speed thinking he’d fit through, but instead getting his rear panniers caught and going over the handlebars…While his bike stayed upright and his feet stayed clipped to the pedals. Mario joined us for the first 10km of our cycle and we both felt a bit sad saying goodbye. We’d planned our destination for the night based on another warmshowers location, so made our way south towards Thetford Mines. The cycle was mostly uneventful, quite hilly but mostly quiet and pretty. We had a couple of rain showers and headwind, but nothing we hadn’t encountered before. We were able to link up with some cycle paths here and there, and “admire” the asbestos mountains dominating the area. After around 80km we started to get quite tired, and the road to Francois and Aude’s felt never ending. We were following Google maps but as the road got hillier and windier and eventually became gravel, we were kind of exhausted. The pinnacle was having to push our bikes up a gravel hill one at a time! But as we turned in to Francois and Aude’s house, our feeling instantly changed. We were greeted by Aude’s mum and soon realised we had arrived to a family party to celebrate Aude’s sister’s imminent new baby. We were invited to sleep in the cabin in the woods at the bottom of their garden, and after an amazing swim in the river were invited to join them for dinner. We were surrounded by a French speaking family, but the love and laughter they shared kept us included and they all made a massive effort to talk to us in English…Again making us ashamed of our lack of French. We spent the evening eating, drinking and chatting by the fire… Perfection. I had my heart set on a mountain in the south east corner of Quebec, but it became apparent that we weren’t going to make it down there. So we decided to change our plans, do a shorter day heading in the direction of Sherbrooke and hang out at Aude and Francois’s for longer in the morning. We had a slow breakfast, visited the ceramics studio next door and soaked up as much of the atmosphere as we could before we set off. Aude gave us a lift over the two worst hills on the gravel road, but the first 10km were still mostly uphill. We passed through some beautiful rural villages in the hills, and had awesome views over to the Appalachian mountains in the States. We stopped for lunch after about 30km and as we sat down to eat, the heavens opened and a massive thunderstorm arrived. We took our time, had a celebratory 2000km chocolate brownie and waited it out…Grateful about our impeccable timing. The rest of the cycle wasn’t super exciting and the roads got bigger and busier. We cooked dinner by the side of Marbleton Lake before going to meet another group of inspirational people. 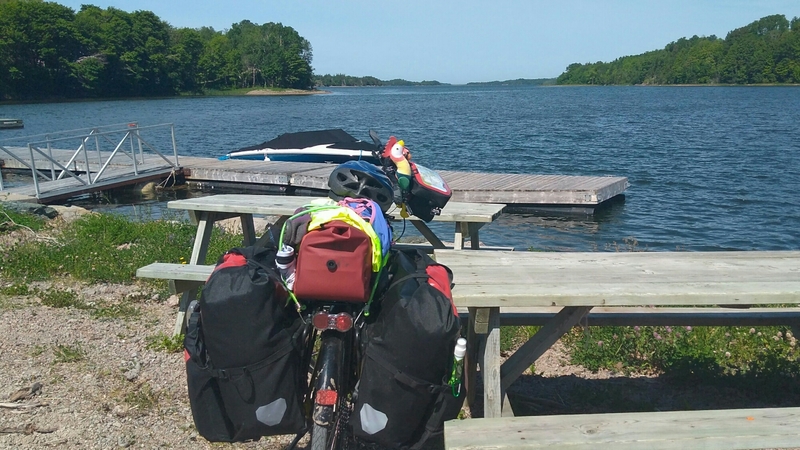 Guillaume, Isabelle and their 3 children spent ten months cycling from Sherbrooke to Mexico. At the time, the children were 9, 7 and 5 and the two eldest cycled the full 5000km themselves. I would never have thought such a thing be possible, and am utterly amazed by the total leap of faith the parents had. 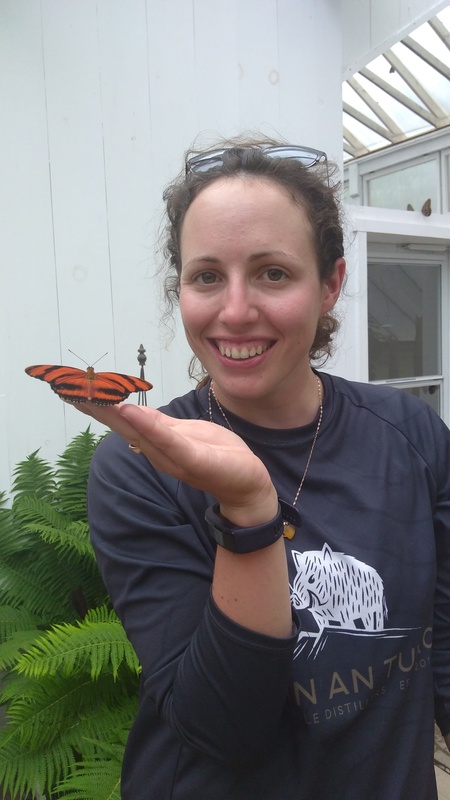 Although the kids did say that ten months was a bit long, I am sure they have gained so much from the trip and will themselves be able to push the boundaries of what we think is possible. We could have spent days with them, hearing stories of their trip and being charmed by the kids, but we felt like we should push on while we were feeling good. We decided to aim for Sherbrooke… National Geographic had listed the Eastern Townships as one of the top 50 places to go in Canada and one of the drawing cards was the cafés. A couple were recommended in Sherbrooke so our stomachs made a bee line for there. As we were making plans day by day, we did a quick search in the morning to see if we could find any warmshowers hosts that we could camp with for the night. Jonathan replied almost instantly so we set of knowing we had somewhere to aim for. The café in Sherbrooke did not disappoint. It seems that a vege pâté/sandwich spread is unique to Quebec and my first taste of it here was divine. Topped off with a delicious coffee and friendly people…Very happy indeed. Google told us it was an easy 20km cycle with 30m of climbing to get to Jonathan’s so we were feeling great. Unfortunately, a music festival in the middle of town closing all the cycle paths had other ideas, so instead we got lost for 2 hours and arrived a bit more hot and bothered. Jonathan’s house by the lake was a little bit amazing. He had a room inside for us and his garden was full of activity of two Bernese Mountain dogs, chickens and bee hives. He spoilt us with beer, a BBQ and homemade honey and we had another great evening of conversation and laughter. Jonathan told us that having us there and hearing our stories allows him to travel too, and I think that’s one of the fantastic things about warmshowers and I can’t wait to host when I get home. We were two hours “late” leaving in the morning as Jonathan offered to open up one of the bee hives and challenged us to search for a queen bee. It was great to learn some simple facts about bees and the way they work, and reinforced my desire to have a few of my own. We set off, reluctantly as always, and aimed for Dunham where we’d be stopping for a week at a workaway farm. More closed cycle paths meant we got lost initially, but we eventually found our way to the beautiful little town of Magog. I had an embarrassing crash in front of too many people thanks to a crack in the cycle path, but no harm done. We also stayed on the cycle path a little bit too long so veered off route a little… But this resulted in us finding a really cute little boutique to stop for lunch. We got chatting to the owner and ended up getting a tour of her (very clean!) soap making workshop. The cycle on from there wasn’t too eventful, although it was on nice quiet roads with a pretty landscape. We made our way slowly but surely towards Dunham and to Three Acres Farm. Amazingly we’ve already been here for a week, stacking wood, bottling wine, picking garlic, harvesting honey, throwing horseshoes, drinking beer, jumping in rivers and generally having a good time. All the while our bikes are in the local shopping receiving some overdue TLC. We’ve decided to stay at the farm for an extra couple of days, but I’m looking forward to getting back on the saddle again. We’ve got about 100km to Montreal then it’s off to Ottawa where we’ll be jumping on a bus to skip through most of Ontario. We have received so much kindness and generosity on this trip, and are always blown away when all we expect is a little patch of grass to camp on and perhaps a warmshower. But, for me, there was something even more special about the people we met in Quebec. Everyone just seemed to have a little bit of magic. I love wild places and exploring remote landscapes with no one else around, but as the great Alexander Supertramp said, “Happiness is only real when it’s shared.” A place really comes alive when you get to meet and laugh with the people who make the landscape their own. 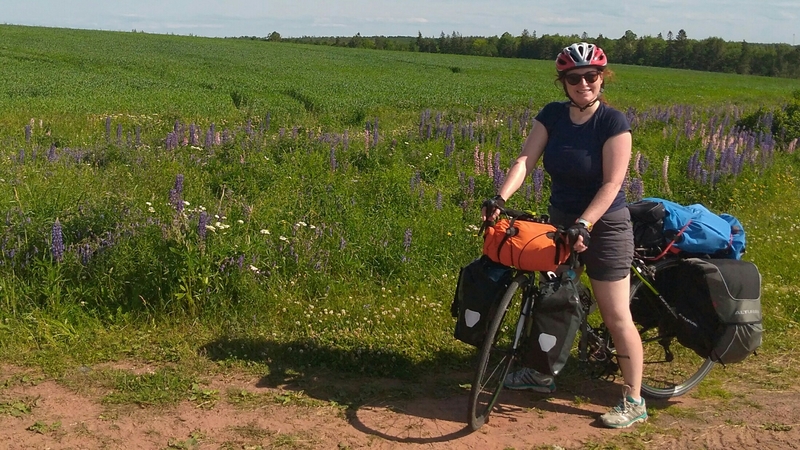 I left PEI with a love for cycle touring and the community that comes with it, excited for seeing New Brunswick and to then get on to the (slightly) bigger provinces. 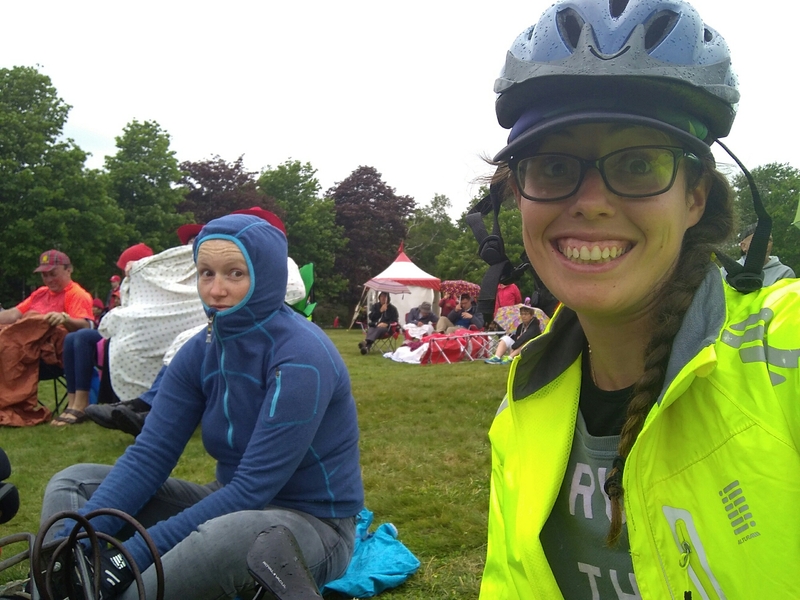 Although Kirsty mentioned she was getting tired of the cycling, I heard but struggled to listen to what she was saying, and kept pushing on trying to find the pedaling motivation for both of us. However, something about our trip through New Brunswick broke both our spirits. It turns out we don’t love cycle touring as much as we love cycle exploring… We love getting off the highway and seeing beautiful places; mountains, beaches and wild spots, and we love meeting the people that live and love in that landscape. Unfortunately (for us) New Brunswick was mostly just a road, and in some sense lacked the magic that the other provinces had, although (as always!) we met some fantastic and amazing characters along the way. We started our New Brunswick journey by arriving via the Confederation Bridge from Prince Edward Island. The bridge is 13km along and sadly they don’t allow cyclists to pedal across. They do however provide a very cheap shuttle service, so we couldn’t complain. It was a mean feat of engineering, apparently taking over 3 years to build only 20 years ago. Once every couple of years they close the bridge for a running race across it, which would be pretty cool to do! 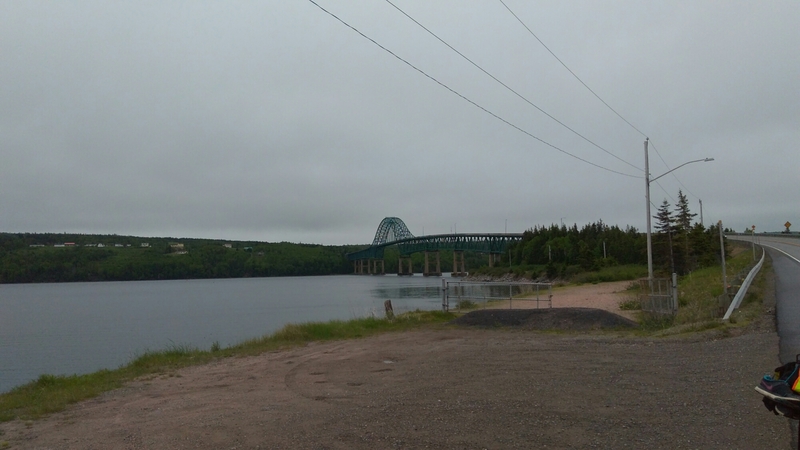 We arrived late in the afternoon and only really knew we wanted to head north along the coast, eventually getting to Campbellton and then crossing the border to Quebec. So we took the smallest road we could and kept an eye out for a camp spot for the night. Immediately the place felt different, bigger and less openly friendly in some ways. Every house seemed to have lots of garden so there weren’t any wild places for us to pitch our tents. We spotted a man outside mowing his lawn next to a paddock of horses, so asked if we could possibly pitch in his garden. He kindly agreed, letting us also use the washroom inside! We were greeted in the morning by his super friendly golden retriever Owen, who ended up joining us for breakfast and plenty of pats before we set off again. We had arranged a warmshowers stop in Shediac, so had that in our sights for the end of the day. It would only be about 65km away so we felt cruisy and at about 12km in decided we both felt like stopping for a coffee. This first place arrived at almost 40km and up until then we hadn’t seen anything but tarmac, trees and the odd house. We filled ourselves up with a greasy lunch and hoped for a more scenic afternoon. We were following the ‘Acadian Coastal Scenic Drive’ so we thought we’d be on the coast… But the road was just inland enough that we could tell the coast was there, but couldn’t see it. We stopped for an overpriced ice cream when we arrived in Shediac before heading to our warmshowers, feeling a bit meh from the day. Alana and Daniel were lovely hosts and we camped under the trees in their garden. We went for a wander down to the rocky shore for a paddle but the water was a bit warm and stagnant… Not too refreshing! So we whiled away the evening looking at maps and watching the sunset through the trees. In my journal for the following day, I say the highlight of the road was eating a whole jar of peanut butter. 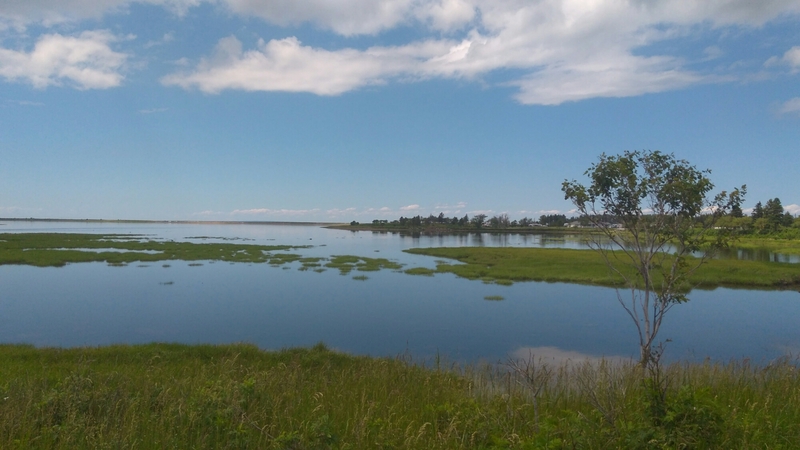 From Shediac to Bouctouche was especially unexciting, but from there the scenery got a bit prettier. We passed through a few communities, and as New Brunswick is the only officially official bilingual province in Canada, we enjoyed the presence of the French language on shop signs etc. High school French slowly started to come back, and it was fun to start practicing before Quebec. We arrived in St Ignace and our warmshowers there was such a treat!! 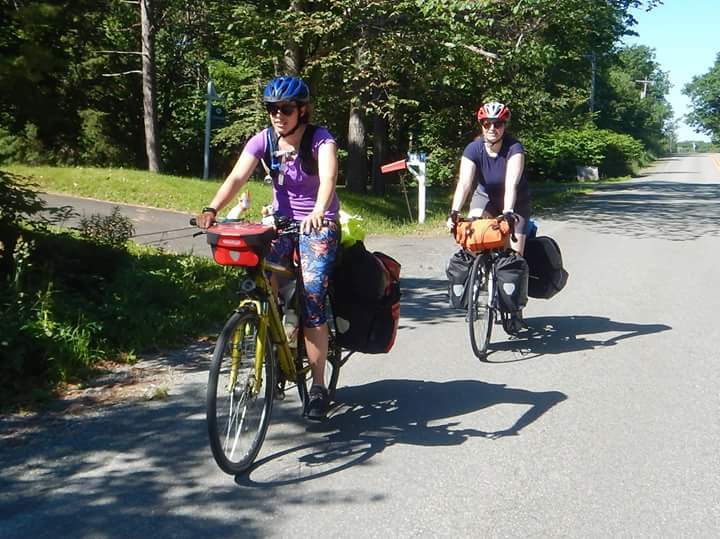 Marthe and Charles had crossed Canada by bike in 2015 and were both of Acadian descent. They cooked us a delicious dinner and we had a lovely evening laughing and chatting over the table. 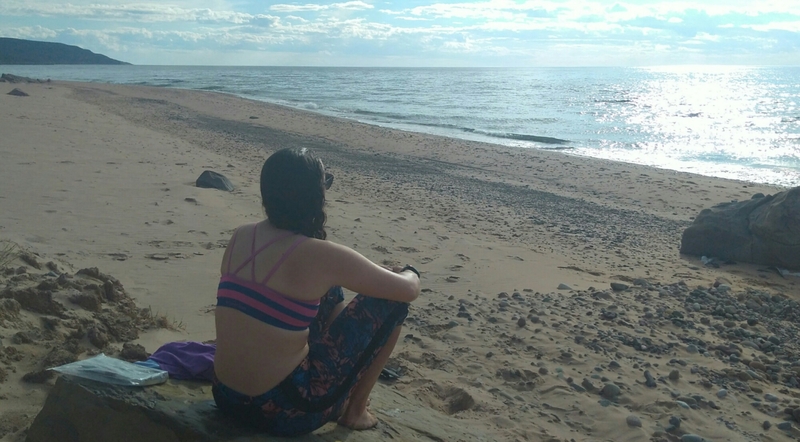 We had a short day the next day, so Marthe took us to Kouchibouguac beach which was just stunning. It showed us that New Brunswick sure has the beauty, it’s just not as in your face obvious as the other provinces. We set off for the 60km to Miramichi with warm hearts after spending time on the deserted early morning beach. Kirsty had been for a swim (her favourite thing to do) and we’d been fed and watered to perfection. Most of the cycle was on highway, so again not very exciting. It wasn’t hilly either though so we powered through the kilometers. We stopped around 30km for a snack and shortly after restarting saw a mum and baby moose crossing the road! They were a wee way in the distance and I didn’t have time to get a photo, but it was still pretty cool. We spent the evening in our host (James)’s pool and chatting to Brian, leaving the next day refreshed and inspired. 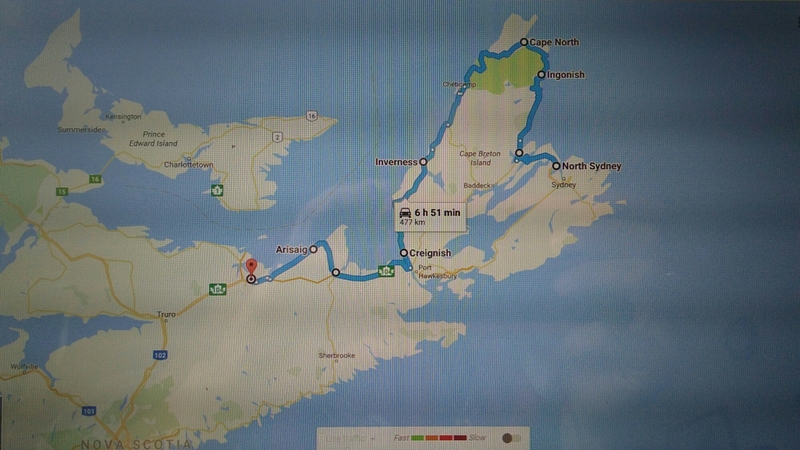 We had Bathurst in our sites and could either go straight up the highway or take an extra day and go around the coast. We’d heard the highway was a bit unsafe and we were craving some beauty so opted for the coast. The road conditions were great, but again there wasn’t much to see. We flew through the kilometers, stopping at a couple of pretty churches on the way. 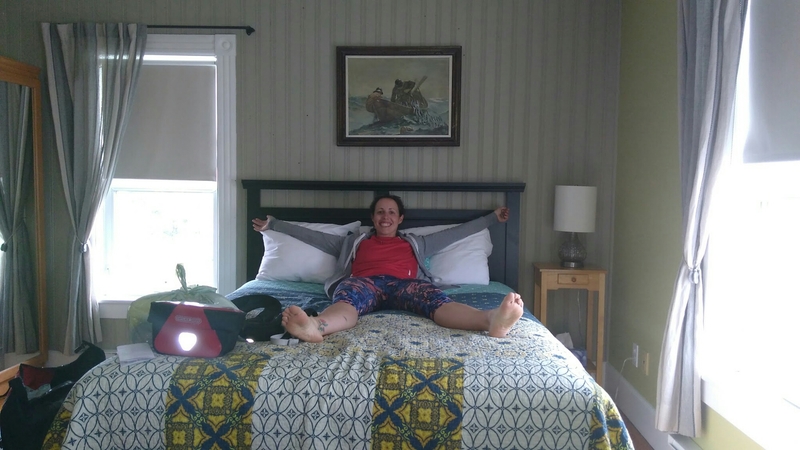 We arrived in Tracadie quite early, but had done 90km so decided to search out somewhere to stay. Campgrounds were full of RVs and children’s fairground types things, so we tried again to find a wild, beautiful spot. It was all private land though, but we were lucky to find ourselves with Robert, Lise and their family. 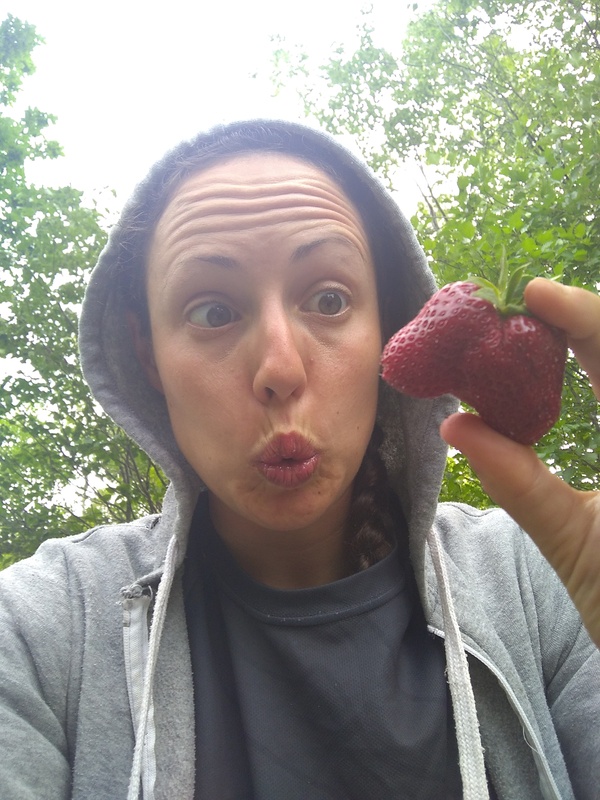 We initially asked them for some cold water, but ended up camping on their lawn, eating their soup, going for a drive and being given a punnet of strawberries to have with our breakfast! I really enjoyed chatting to them all, learning more about how the Acadians came to populate this area and being amazed at their bilingual skills! It really made me feel shameful about how lazy English language speakers are sometimes. We set off again feeling great about the people we were meeting, and had a warmshowers in Bathurst in our sites for the evening. The cycle to Caraquet was fast and easy, and Caraquet itself is a lovely wee French town. We had delicious coffee and croissants, and were able to join a cycle trail along the coast for 10km or so. From there, the road mostly stuck to the coast and we could look over to the Gaspe peninsula in Quebec. 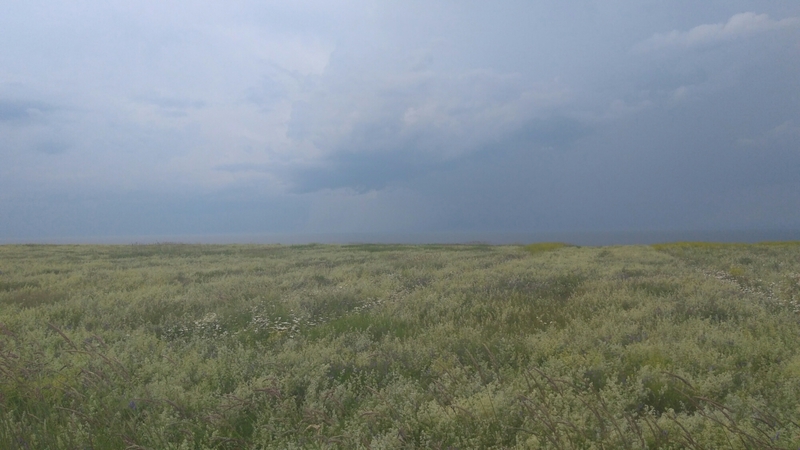 This meant we could see the thunderstorms brewing to the north before we got caught in the many torrential rain showers. Most of the time the warmth and movement would dry us off but by the time we crossed the 100km mark we were looking forward to our warm shower! We camped in the garden again, but were under a tree so amazingly didn’t get too wet. It was so nice just to be able to sit inside, even if Meghan and Dustin’s dog did eat our whole block of cheese…including the wrapper. We are scenery seekers above cyclists, and after a few days of tarmac we were a bit mentally tired. We opted for a shorter day, taking some time to look around Bathurst before cruising for 20km up the coast. More thunderstorms were forecast and my boyfriend Paul offered to shout us a hotel room to allow us to recuperate and stay dry. We were grateful to say the least! 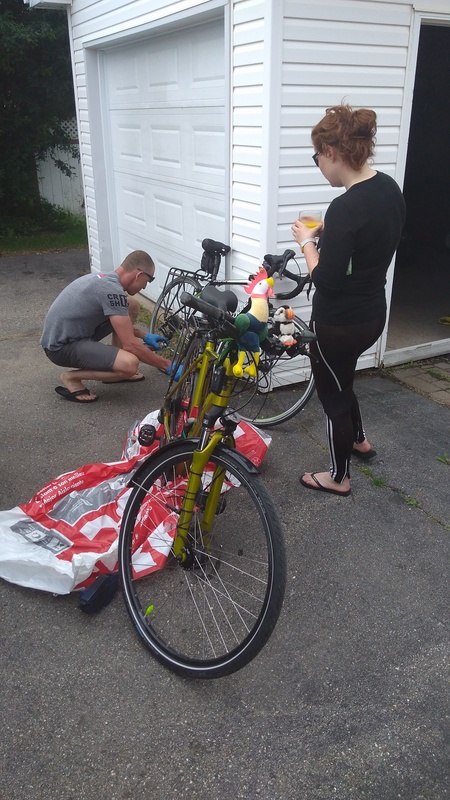 On the way to Petite Rocher, Kirsty stopped at a gas station to buy new sunglasses (after 2 pairs broke in 2 days) and we met Daniel, who took a glance at our filthy bikes and offered to clean them up for us! He told us he had hiked the Appalachian trail a couple of years ago and was blown away by the kindness of strangers, so had come back determined to pay it back to the travelling community. We took him up on the offer, dropped our bags at the hotel and cycled to his garage a few buildings down. He took time to teach us a bit about tuning and taking care of our bikes, and even bought us beer to drink while he worked away! The rest of the evening was spent eating, watching Netflix and being on the comfiest bed in the world. We both slept like logs. Setting off again we both felt pretty heavy. The highway was hilly and boring and the headwind meant we were pedalling to go 16kmph downhill. Kirsty even dipped below her usual 5/10 emotional state and the road ahead seemed long and uninviting. 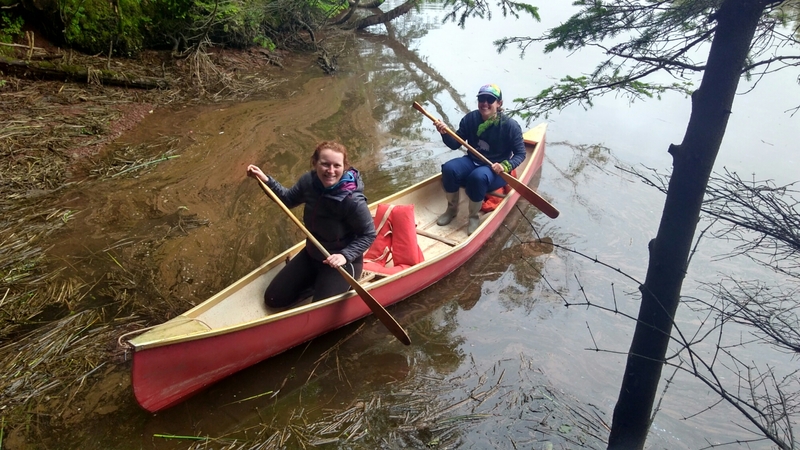 We floated the idea of public transport to skip the slog and get to the scenery, so when we arrived in Campbellton that became our mission. There was an overnight train to Quebec city for $600, but we opted instead for a bus the following day. The decision and booking was made in haste, and I felt a little disappointed that we were caving. However, we’ve been on the road for 5 weeks, have cycled almost 1800km and are a team. We came to experience Canada in the 4 months that we’ve got, and in that time we don’t just want to be slogging through kilometers on our bikes. And even Stumpy is looking a bit tired of the road. So we waved goodbye to Campbellton and New Brunswick and crossed the bridge in to Quebec, turning our clocks back an hour as we did so. On the bus now to Quebec city, hoping to rediscover our mojos, hunt out some beauty and EXPERIENCE province number 5! 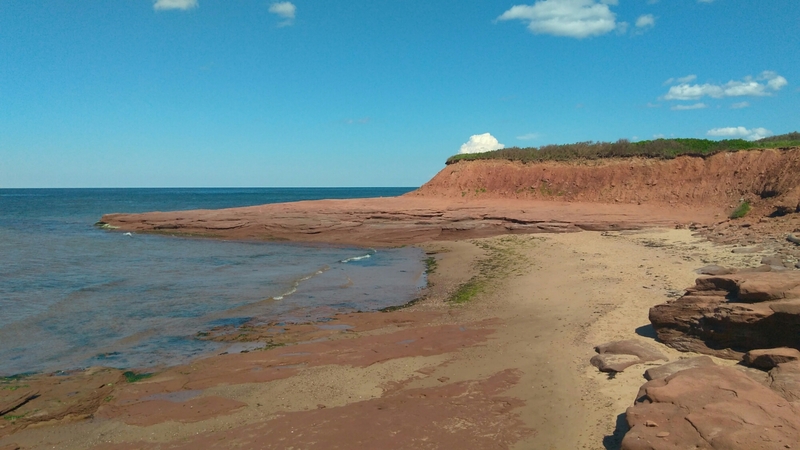 Chapter 4: Prince Edward Island, and a potentially broken toe..
Our time on PEI has been short but very sweet, and longer than most! 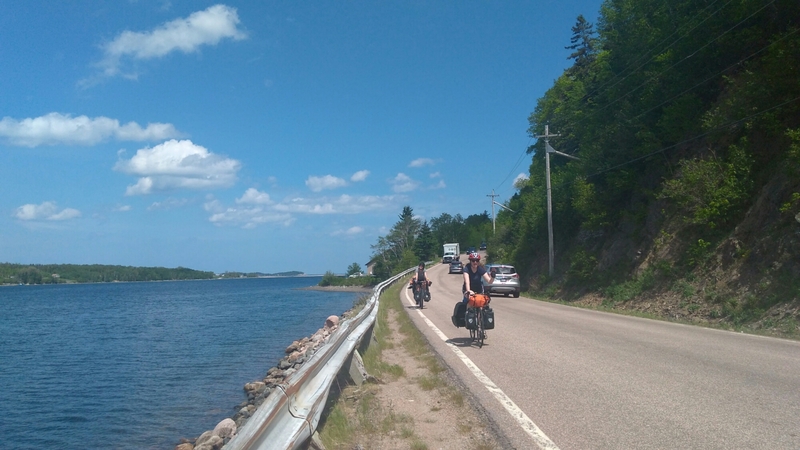 It turns out that most people who cycle Trans-Canada don’t come to Prince Edward Island, or if they do they just do the 80km or so between the ferry and the bridge. Admittedly, this is what we had originally planned but (as has become our style) we decided to zig zag around and spend some more time exploring Canada’s smallest province. We also learnt that Charlottetown on PEI was the “birthplace” of confederation, so we thought it could be a cool place to spend Canada’s 150th birthday on 1st July. We left New Glasgow early on Tuesday morning after a great rest/admin day getting lots of things ticked off our to-do list. Alasdair joined us for our cycle to Caribou, making a great opportunity for a bit of a photo shoot. Unfortunately I was feeling quite run down and cold-y, so have a smile missing from most of the pictures! 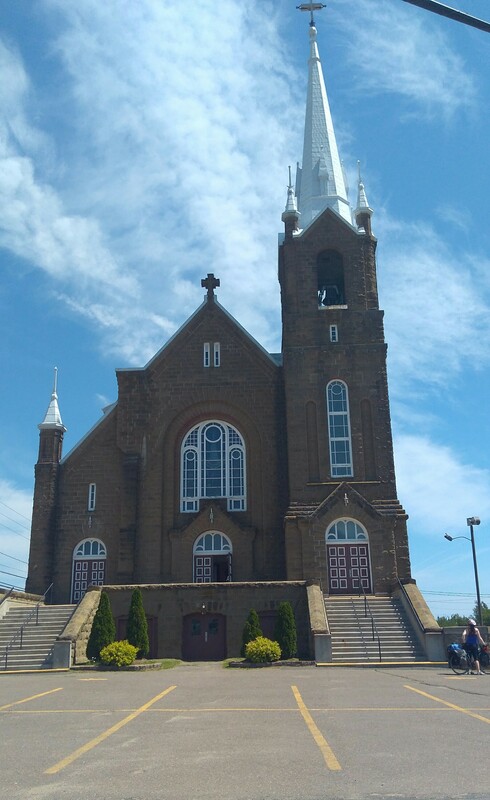 It was another beautiful blue-on-blue day, and the crossing of the causeway to the cute town of Pictou was lovely. We passed a flock of Cormorants who were also enjoying the view, but were also unfortunately stinking out the bridge so we couldn’t stay for long. Pictou itself homes the replica of the Hector, the ship that the first Scots took to (what would become) Nova Scotia in 1773. It was mad to imagine over 200 people aboard, setting off to an unknown land… sadly mostly to escape religious prosecution back home. We caught the ferry from Caribou over to Wood Islands and again I soaked in the blue on blue, enjoying the smooth crossing out on the deck. Once on PEI, we decided to pretty much head straight north to hit the coast. The roads are crazy straight, but not flat like we were promised they would be! Most of the land is rolling farms, which could explain the straight roads splitting the properties. The soil is an amazing colour of red, and the farms were so neat with rows and rows of crops. Apparently the colour comes from a high iron content so we wondered if this helps the famous PEI potatoes grow. We stopped in Montague for a celebratory 1000km ice cream sundae before cycling on to St Peters to complete our first accidental almost 90km day. On the way, we saw a couple of members of the Amish community, one of whom was driving a horse and cart and looked quite surprised to see us! We happily arrived in St Peters and rolled around looking for a place to pitch our tents. We spotted a patch of grass next to the water and asked a lady who was hanging out her washing if she thought we could camp there. It turned out it was her land and she was happy to let us set up for the night. Anne ended up coming over a couple of times to chat and filled us in on local history including where we might find some distant relatives on the island. She later came over with cinammon buns for the morning, and showed us again that Canadians are a special breed of kindness. We had very warm hearts while we watched the beautiful sunset and settled down for the night. We enjoyed a slow start on Wednesday, having coffee and breakfast in the community gazebo. 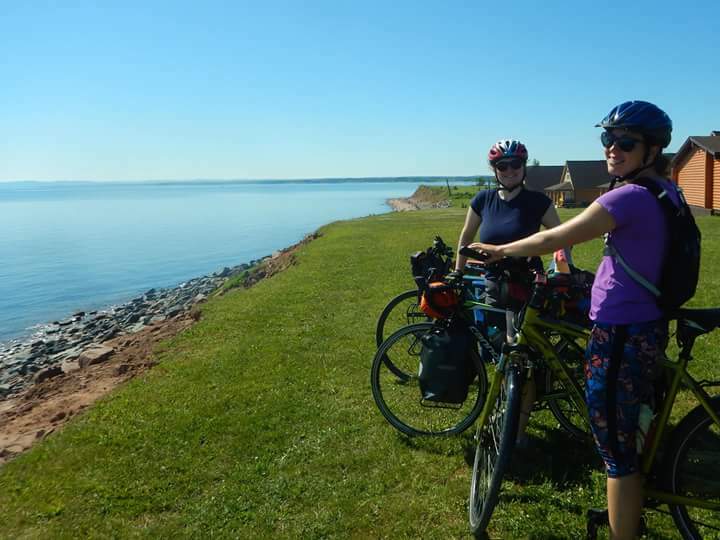 After soaking up some WiFi from the tourist information centre, we started off our day by cycling along the confederation trail. It was a treat to be away from the road and cars, and a pleasure to be surrounded by green trees. We stopped in Morell for Kirsty to search out her McGuire ancestors, then again in Mount Steward for a greasy lunch. The trail began to get quite loose and deep gravel, so we both lost traction in our back wheels a couple of times. Turning off on to the route 6 coast road was really nice, especially as we came in to the national park so the potholes stopped and the green and the blue were intensified. The beach went on for miles and the sand was a golden brown, we stopped at the first opportunity but Kirsty to dip her feet, then again a few kilometers later for us both to have a snack and a nap. We still had 30km to go though, so didn’t stop for long. 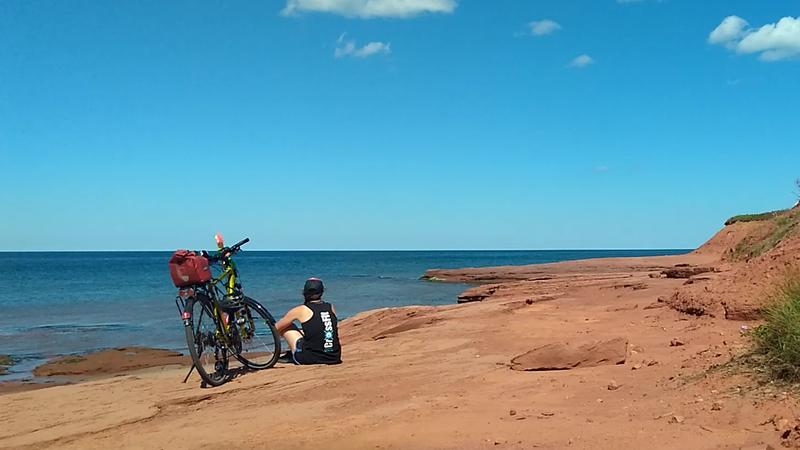 It was another accidental almost 90km day, so we decided to spend the following day looking around and taking some time to soak in the coast and beautiful surroundings. Cavendish is where Anne of Green Gables was imagined and set, so we went to visit the house which inspired the stories. It was beautiful, but really busy and touristy (great for PEI, not great for me!) so I found a quiet spot to sit and soak up the sun and the hills while Kirsty wandered around. 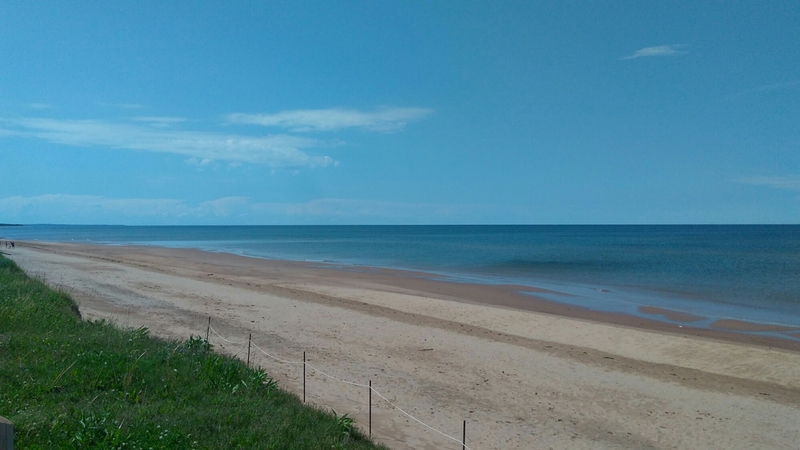 We then went to Cavendish beach which unfortunately was similar.. beautiful but busy. 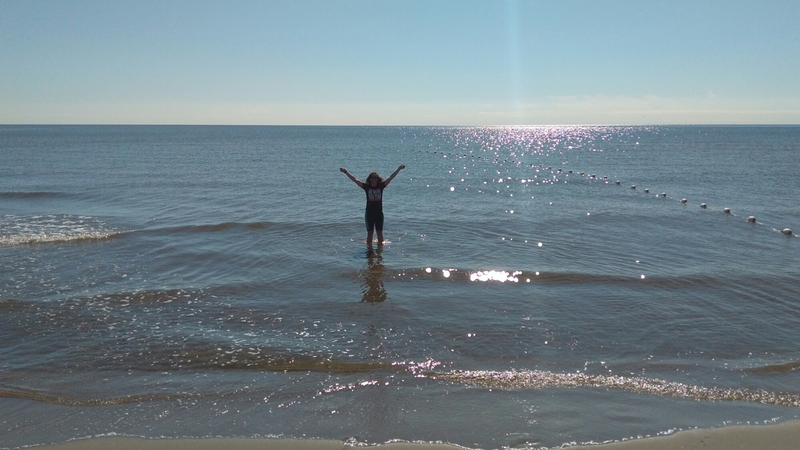 This was our first real experience of Canada tourism as the season is really just beginning, but I was keen to explore the area a bit more so I left Kirsty sleeping on the beach and cycled off on my own. I headed off towards Oceanview national park, and as soon as I turned off the highway I was greeted with quiet and calm. I spotted a path down to the shore which didn’t have a parking lot next to it, so wandered down with my bike. A couple were just leaving, and I found I had this perfect little beach all to myself. 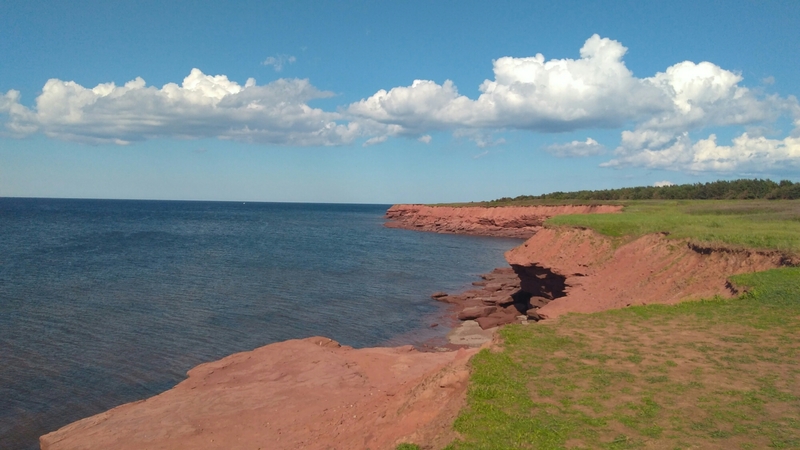 The sea was calm and clear, and it was hard to believe the red rocks lining the shore hadn’t been designed and man made. I sat for almost an hour enjoying the calm, and couldn’t help but feel like my mum and my Uncle John had something to do with the perfection of the moment. Friday brought a little change in weather and the wind and rain picked up just as we were setting off from Gary and Kathy’s. After 12km or so we stopped in New Glasgow (still on PEI!) at the PEI preserves for a second breakfast and some coffee. 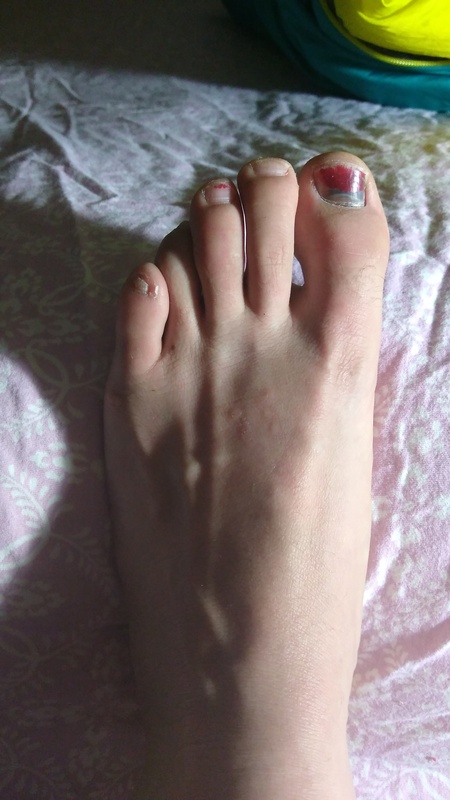 My toe only hurt occasionally while on the bike, and if I stayed unclipped from my cleats wasn’t too much of a bother. Our second breakfast was super delicious, and the preserves shop had samples of all their jams and relishes, so I had to pull myself away to make sure we would actually get somewhere by the end of the day. As it was still raining, we headed to the Garden of Hope centre, a hospice for islanders with cancer to go for restbite care. They have a butterfly house which you can go in and walk around or sit and have butterflys land on you. It was a little bit wonderful and the butterflys were beautiful…again, we didn’t want to leave. We cycled on through the rain, knowing we had another warmshowers in our sights. We arrived in Bonshaw without passing a single shop to pick up some dinner, but arrived to an invitation from Marion and Tony to share their meal with them. They also offered us their cabin to sleep in, again to prevent the tents from getting wet, so again we eagerly accepted. We are now worried we are going soft, so need to do some wild camping once we get to New Brunswick! 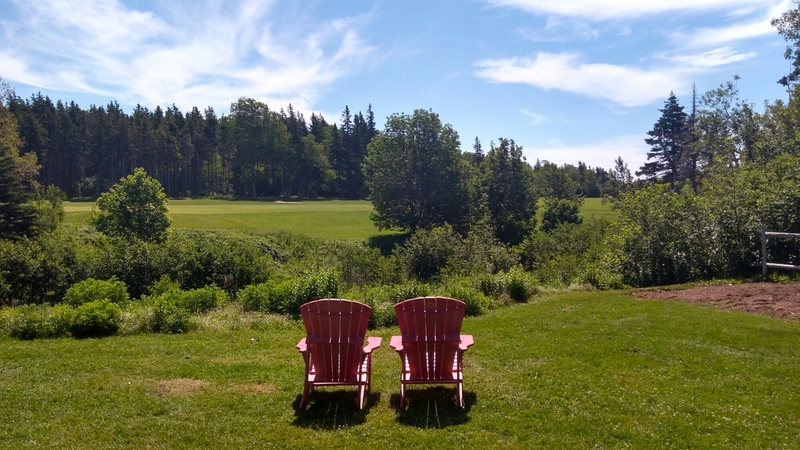 Tony and Marion live close to the Trans-Canada highway, but it couldn’t feel further away. They have a beautiful, big garden where they grow their own vegetables, have a solar powered shower and the cabin we are in has a composting toilet and is surrounded by trees. They also have a river practically on their doorstep, and we were lucky to join them for a paddle in their Canadian canoes before dinner. Again, a little bit wonderful. 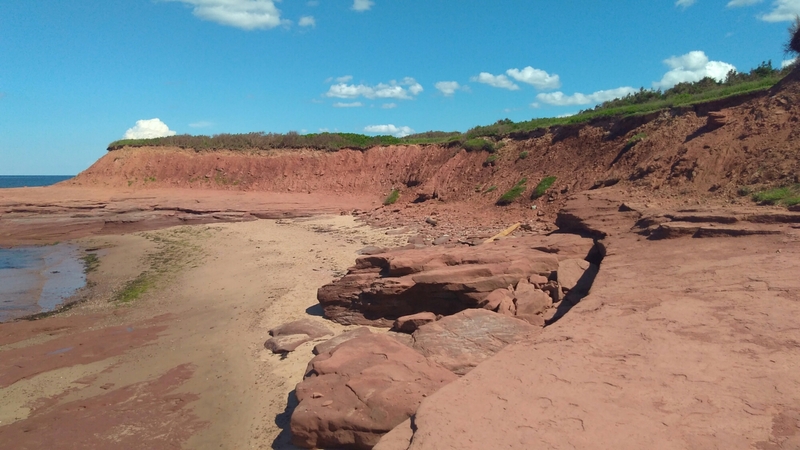 After dinner, we went for a drive down to the Argyle shore on the south coast of PEI where the sand is even redder than on the North, before listening to Marion and Tony sing and play guitar. And then it was Canada Day! Lots of people had told us how cool it would be in Charlottetown on Canada’s 150th birthday, so we were looking forward to the buzz of the celebration day. I’m not sure what we were expecting, but it was a lot lower key! We still managed to take in a musical which highlighted that although it is 150 years since the confederation, the land itself is much older and the natives and indigenous people should also be celebrated. We also watched a video about the confederation itself, and how the joining of the provinces came about. Other than that, we ate a lot of food, wandered around the harbour and watched some live music in the rain. The fireworks weren’t due until 10pm, so we decided to flag them and cycle back to Marion and Tony’s cabin in the woods. We were greeted with more music, including “Never tire of the road”, which rings true to us as we get ready to set off again in the morning. Kirsty and I were pretty sad to be leaving Newfoundland last week. We spent the last few days with Gerard at his honey farm in Placentia, being put to work building fences and clearing rocks for planting quinoa along with Kari and Elena from Mexico. It was great to have a good break from cycling and to stay in one place for a few nights. Gerard was also super generous and took us out to see the gannet colony at Cape St Mary’s on our last day. 70000 gannets – what a way to see out our first province!! Newfoundland was a big challenge (cold, windy and hilly!) but the people we met made it unforgettable. On the way to the Cape we spotted another cyclist who was packed up looking like a tourer, so we pulled over to say hello. 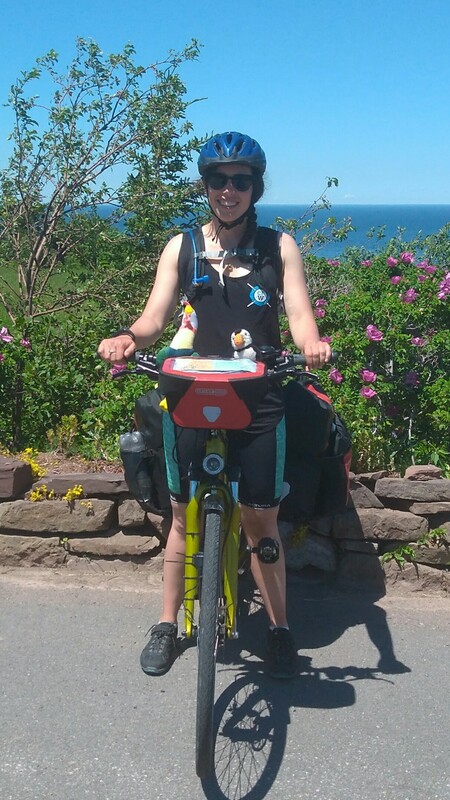 Adrienne had been cycling since March around Eastern Canada and was due to get the same ferry as us that afternoon. We were super excited about a potential new friend (!!!) and we ended up meeting another cyclist, Pete, on the boat too. The 16 hour ferry ride wasn’t actually too bad… we spent the first couple of hours chatting with Pete and Adrienne, exchanging stories and plans and eating at the buffet. Three sea sickness tablets later and I was out for the count, waking up two hours before the boat docked in New Sydney. Just enough time to write a couple of postcards and have a shower before we cycled off on to Nova Scotia. The weather was initially a bit drizzly and grey, but we stopped in for coffee and some breakfast with Pete and Adrienne. 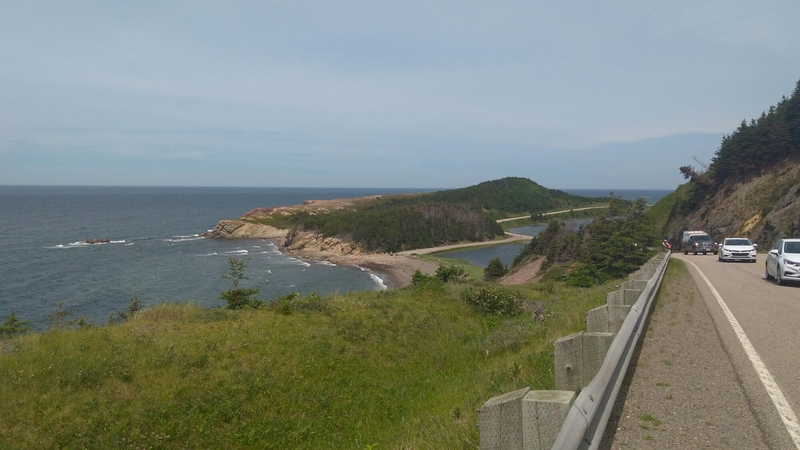 We were all planning to head towards the Cabot Trail, voted one of North America’s best scenic drives. Pete had organised to hire a car and drive the trail, as it is quite a detour off the East – West journey and he planned some different detours on his was to Vancouver. Although Kirsty and I were already behind “schedule”, we decided to join Adrienne for her ride around the trail. We’d been told it was worth the miles and the hills, and we figured we could make the time up elsewhere. We had to do about 30km on the Trans-Canada highway to get out of North Sydney and on to the Cabot Trail. 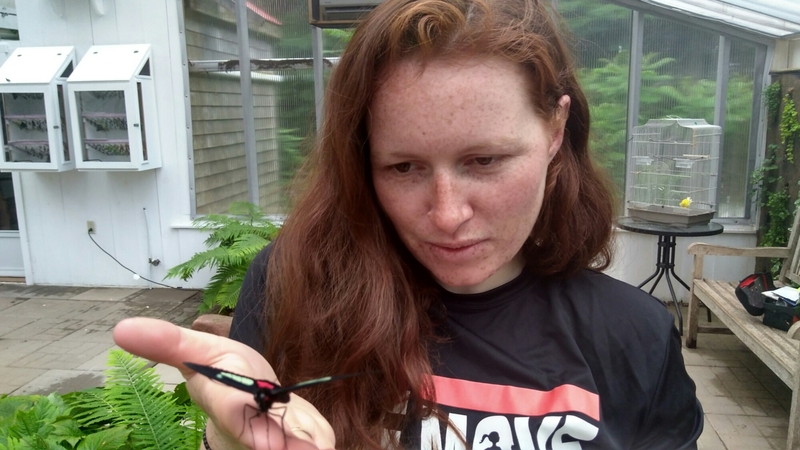 Kirsty and I had mostly avoided it in Newfoundland, so I found the business in Nova Scotia a bit terrifying! Cars pass at 120kmph and it feels like they are centimeters away… It’s noisy and busy, and with the drizzle and wind just wasn’t that enjoyable. Turning off in to Englishtown was such a relief. As soon as we hit the Cabot Trail I was in love. We opted to take a short cut and took a 5 minute ferry from Englishtown to Jersey Cove (which was free for cyclists!) and then cycled along a causeway for a few kilometers. We started to look for a place to pitch our tents, but we came across “Joyful Campsite” and at $12 each decided to treat ourselves for the night. There were heaps of RVs but we were the only tents and had a pitch right on the waterfront. Kirsty even managed to hang her hammock and both her and Adrienne went for a swim, so we were all loving it. We left camp the following morning just before 10am, and had a really cruisy first 25km. 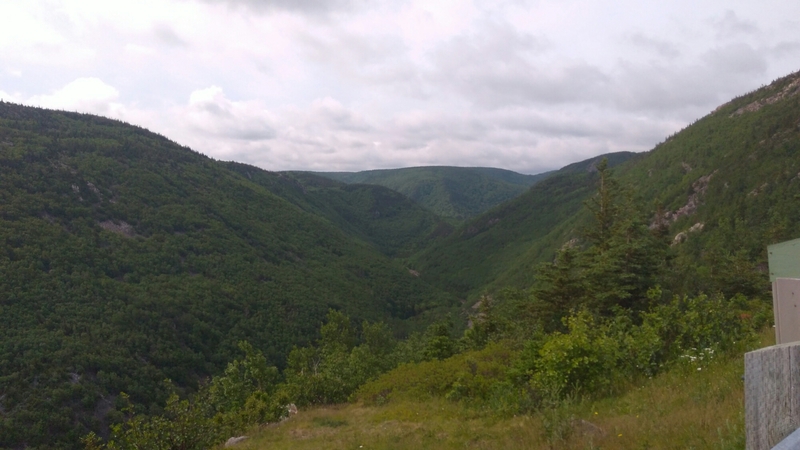 Cape Breton is just stunning, and the Cabot Trail takes in some amazing coast line. We stopped at the Dancing Moose Cafe following a recommendation, and oh my god I had the best pancake I’ve ever had!! It helped of course that the staff were super friendly, there were chickens on the doorstep, and we sat in the sun. A great way to start our Cabot Trail journey. 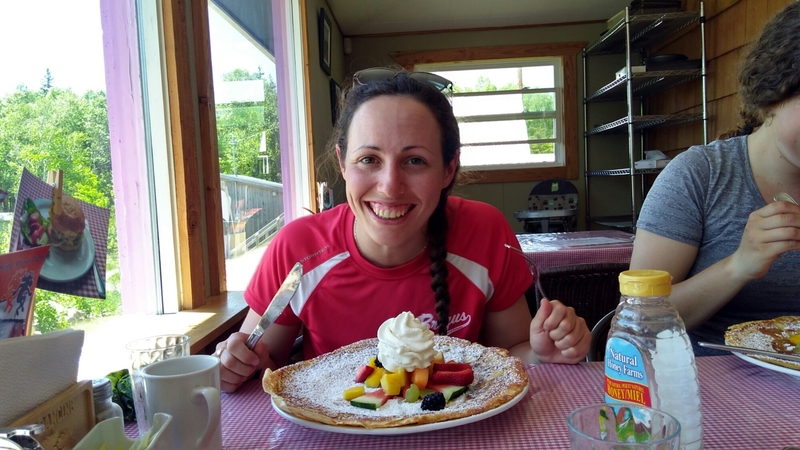 The next 25km were more challenging… I felt really heavy (pancakes!) going up even small hills and then we were faced with Cape Smokey – apparently the 10th worst hill for cyclists in Canada. It’s only a 211m gain but climbs this over 2.2km. It’s steep! You get to look up on the climb from below, and the first corner made us all fall off our bikes as we instantly lost momentum! It was steaming hot and for once there was very little wind, so it was kind of torture. We got lots of encouraging toots and smiles from passing cars coming up and down the mountain, and thankfully weren’t overtaken by any other bikes. As we reached the top though, a campervan pulled over and a cyclist climbed out!! He didn’t even have any bags… what a cheat!! The downhill was really fun and as we pulled in near the bottom a man from a hotel office came out with drinks for us! We downed them quickly, cycled on a bit further before stopping at an ice cream shop for a longer break to escape the burning heat. We’d done about 50km and planned to do another 20 or 30, but after 60km we were all done in. We pulled in to a little harbour and asked a couple in a house if we could camp on the beach in front. It turned out they owned the land so they showed us round the back of their property where it was flatter, slightly more sheltered and we had a private beach (where we all went for a swim!) and a view over the cliffs. After quite a restless night in some pretty strong wind, we set off before 8am for what would be our hottest, hilliest, longest and furthest day!! It was already 27 degrees when we got going and was hilly straight away. It was really pretty though and after 20km we turned off the main road to take a scenic coastal route. We were passed by the support vehicle for 5 touring cyclists (one of the men’s wives who was driving their stuff between campsites) and she stopped to give us all some powerade at the top of one of the hills. Not long afterwards, my chain came off while trying to drop down gears too quickly up a steep hill, so the said 5 cyclists caught us up and overtook us, rather smugly for a group not carrying any gear! We stopped around noon for some coffee and wifi, having already covered almost 40km. We stopped again along the road a bit for some shade and packed lunch, before setting off again around 3pm. 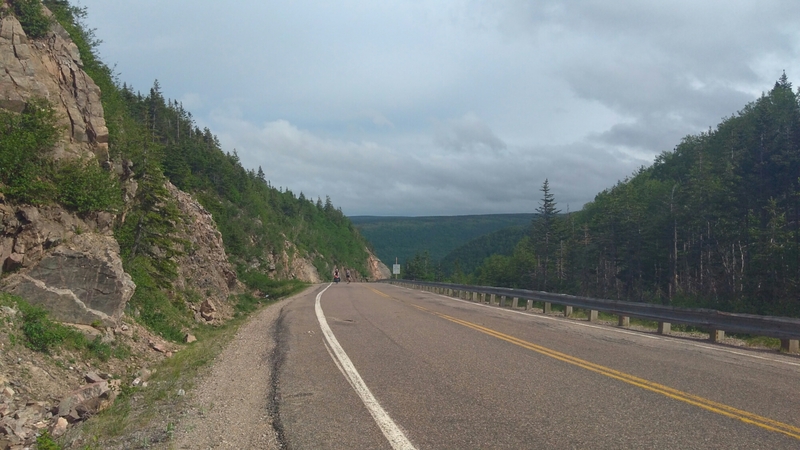 We knew we had two more “big hills” on the Cabot Trail and were keen to get through one of them before stopping for the night. The next 30km were killer. It rained, was windy and was hot!! We were all feeling tired from a lack of sleep and the previous 40km, so the next hills felt extra hard. The “big hill” (North Mountain) went on FOREVER! It wasn’t as steep as Cape Smokey, but was longer and took about two hours to do the 12km or so of up. Adrienne was a good motivation for both me and Kirsty, and we were so, so glad to get it done. The downhill was AMAZING, I clocked 58kmph before I got scared and put the brakes on, but the roads were emptying and we had the place mostly to ourselves. We stopped near the bottom of the hill at MacIntosh Brook campsite, an unmanned Parks Canada campsite. As it is Canada’s 150th birthday this year, lots of entry fees to National Parks are waived, so we got this campsite for free. There were signs up warning about bears and coyotes, so we cooked and stored our food inside the hut, and made sure we had no rubbish lying around. I thought I was going to be up all night worrying about it, but after the long day I was fast asleep as soon as my head hit the pillow, and didn’t wake up til the morning. We set off early again, excited to get over the last “big hill”. It was so much better tackling the hill in the morning, and it was so incredibly beautiful again. We stopped at every viewpoint for a rest and to take pictures, and just took our time going up. We thought we reached the top quite a few times, but more steep sections kept on coming just around the corner. McKenzie and French mountains kind of merged together, but after 40km we were at the bottom of them both, enjoying our packed lunches again. The downhill of French mountain was the best ever. If you google The Cabot Trail, it is what the pictures are of. I really wished I’d had my GoPro on video so I could relive the exhiliration, but I guess there will be more like it to come over the next 7000km. The satisfaction of pushing to the top of a big mountain, enjoying the view at the top then cruising down the other side is totally addictive. We stopped in Cheticamp for a couple of cakes, and then a fish burger. 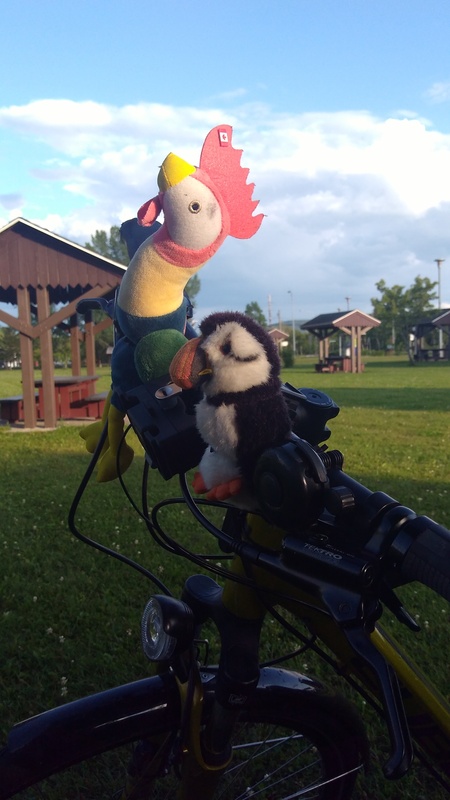 We hung around for a couple of hours while Adrienne got her bike fixed at a local shop before we headed to Grand Etang where we had arranged a Warmshowers stop for the night. Kevin cooked us fish that he’d caught the day before and entertained us with stories of other cyclists he’d had passing through. We slept soundly inside before a delicious breakfast and setting off on the road again! The cycling from here was easy, we were all feeling pretty slow so just took our time along all the undulations. We stopped after 12km for a coffee and (two) grilled cheese sandwiches, and to also catch up with Wifi and emails. We then cruised for another 45km to the little town of Inverness. The cycle was beautiful, the road was quiet, the wind was soft and the sun was shining. Kirsty and I treated ourselves to a paid campsite at Inverness Beach so we could have a swim, shower and rest. If only Day 1 Kirsty and Lauren could see us now!! After Inverness, we cycled on to Creignish. 69km passed with ease and I really loved crusing along yet making great progress at the same time. We stopped off in Mabou for a snack and again in Judique for a coffee at the Celtic Music Centre. The scottish heritage along the Cape Breton coast is really cool, almost more Scottish than Scotland! We started to look for somewhere to camp around Creignish, and ended up knocking on a door to camp in a garden. We were lucky to be warmly welcomed by Keith and Bernadette, who had a great view over the ocean and cooked us a delicious breakfast the following morning. Another case of Canadian hospitality that we will never forget. 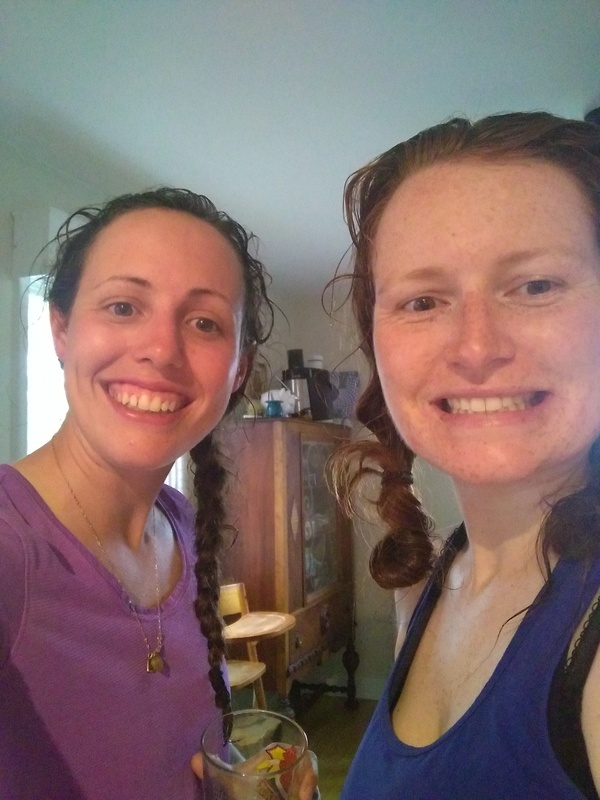 We had quite a wet and windy night and the next day was very humid, but we cycled on for another 73km to Antigonish. It was a pretty non-descript day and most of the time I felt like pulling over for a nap. The wind picked up around lunch time, so by the time we reached Antigonish and I had a plate of poutine in front of me I was extremely happy. We had organised a warmshowers stay and were to be there for 7pm, so we wasted some time in the local craft beer bar. 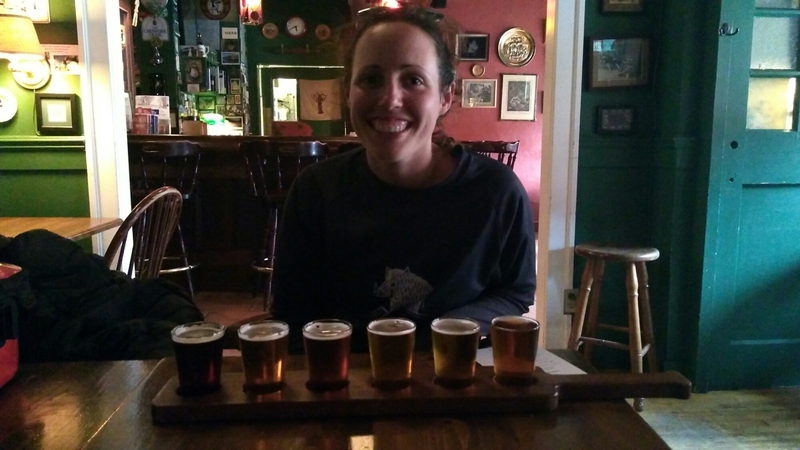 I had a taster board of 6 local Nova Scotian beers, the Big Spruce Kitchen Party Ale being the clear winner for me! Yum. 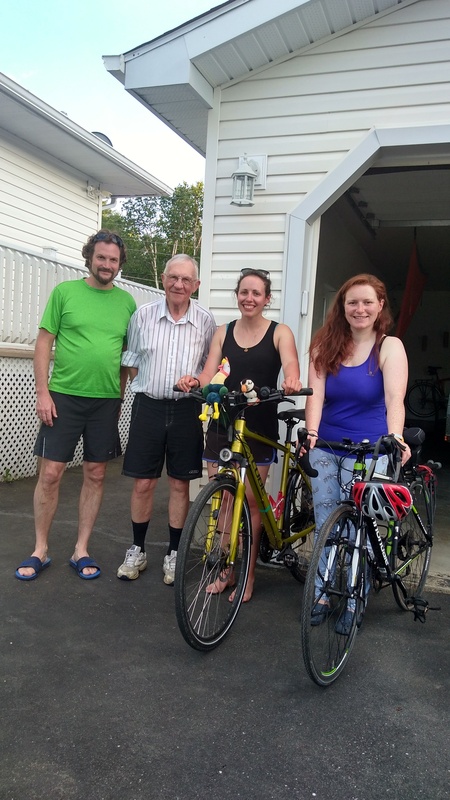 We were hosted by Sarah and Chad in Antigonish who were an amazingly inspirational couple, and sent us off again with a great breakfast and a warm fuzzy feeling. 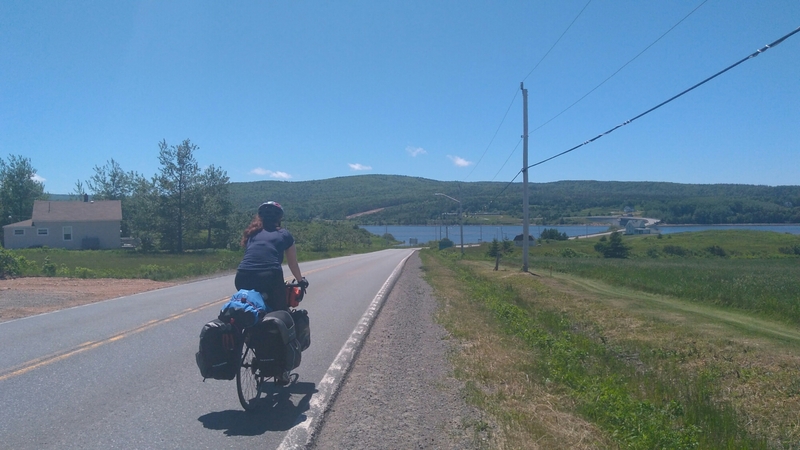 Our last cycle day in Nova Scotia was a beautifully sunny day so we decided to take the scenic road between Antigonish and New Glasgow. It took us through Arisaig, Knoydart and Lismore, all places from near by us in Scotland. The coast was beautiful and while we were in a gas station we got talking to a man who, as it turned out, was on the Warmshowers website. He invited us to fill up our bottles with cold water so we stopped in with him and his wife about 10km down the road. They had an amazing property right next to a river with lots of land, and they bought it for about £40k! Think we might move here…! We’re now in New Glasgow enjoying a rest day being helped out by Alasdair and Cheryl, my friend’s dad’s cousins. We’re now at 938.1km total, and have done 100km more in the last week than our whole time in Newfoundland. Nova Scotia has been super special, warm and green and beautiful, and we are stoked to be ticking off our second province. Bring on Prince Edward Island tomorrow!